Pokémon Rumble Blast, also known as Super Pokémon Rumble in Europe, is a sequel to the 2009 WiiWare game, Pokémon Rumble. It's a fully-fledged 3DS game and features you controlling a toy Pokémon through a variety of stages, taking out the Pokémon you encounter as you go through. This game introduces the Pokémon from Pokémon Black & White into the toy-Pokémon fold and will have you controlling and unlocking them. It has a single player mode, as well as a two player local multiplayer as well as Street Pass capabilities for obtaining Pokémon. 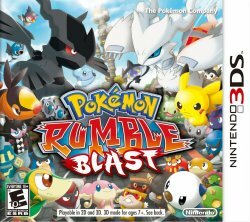 Pokémon Rumble Blast has numerous different Game Modes including the standard gameplay mode where yo go through levels, the Battle Royale mode and the brand new Charge Battle which has you control a massive army of toy Pokémon. Unlike the first game, this one has a storyline. In it, you quickly find that all the Light Springs are drying up in all the towns in Toyland. As such, you have to investigate into the cause of this and soon find Cobalion is behind it. Your task is to stop Cobalion and his minions and return the Light Springs to the fountains in the towns. Also unlike the previous game, there are more than six different stages here. There are five worlds, each with at least threes in which house two or more standard levels as well as a Battle Royale, Team Battle or Charge Battle. These all have different Pokémon in, allowing you to obtain all 646 Pokémon. Mechanically, the game functions identical to the previous one, where you collect a toy through battling in the level, using one of two moves to damage the opponent. The toys are not able to increase their strength, but you can get stronger ones as you go through and increase the World Rank. Some of the Pokémon you find will have special abilities that can enhance their strengths and you can teach the Pokémon toys various new moves through vending machines allowing you to customise.